We first launched the TouchArcade app all the way back in May of 2012. To put that into perspective with what was happening in the world of iOS at the time, that was before iOS 6 would even be announced at WWDC that year, and if you were really cool, you probably had an iPhone 4S in your pocket even though the iPhone 3G and 3GS were still incredibly dominant in the market. It launched before everyone decided they hate textures and skeuomorphic design, and before the wide screen of the iPhone 5. Honestly, I’m surprised it still works as well as it does. We originally had big plans for the TouchArcade app, then two things happened: First off, it was totally ignored by Apple when it was launched, and despite a universally positive reception from people who reviewed apps at the time, never was featured. Without the fire hose of new downloads featuring provided, we only ever saw the installs we could drive ourself off this website, which needless to say was significantly lower than our hopes based on the performance of the AppShopper app which was featured when it was released. The (relative to what you can typically expect with a free app that gets featured) low number of downloads made it difficult to rationalize continuing to develop the app beyond bug fixes and tweaks, but the second problem is worse than the first: Apple shifted their App Store approval guidelines which resulted in minor updates we submitted getting rejected due to them seeing the app as a “store within a store" which promotes other apps- Two extremely big no-no’s in Apple’s eyes. Even if we wanted to release a simple update to the app which fixes some bugs, adds widescreen support, and recompiles the app into a 64bit binary, it won’t get approved without a total rework of the core functionality of the app. It would effectively need to become just a way to read TouchArcade content and the forums, both of which work perfectly fine inside of Safari. 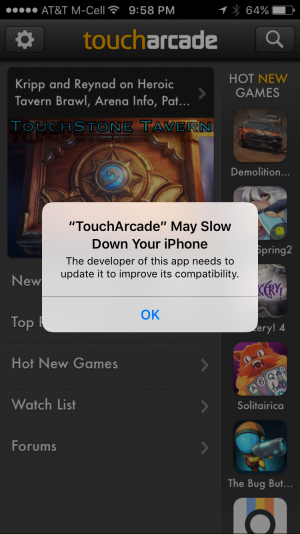 iOS 10.1 introduces a new popup warning people when they launch the TouchArcade app that this app will slow down your phone. What’s actually happening is your iPhone is just warning you that the TouchArcade app isn’t a 64bit app and isn’t running as fast as it could be if it were. Which, again, considering the app was built for the iPhone 3G years ago, any performance hit caused from it still being a 32bit app is vastly mitigated by current generation iOS devices being exponentially faster than the hardware the app was originally built for. I’ve had a lot of people asking me if they should delete the app so their phone runs fast, and really, while that’s totally up to you, what’s actually happening is Apple just chose to word that message really poorly. An app slowing down your phone sounds scary, but, in real-world use, I’m not convinced there’s anything to be worried about. As far as the future of the app is concerned, it’s not looking great. We’re always evaluating different things we can do, but considering it was originally built for iOS 5, anything that is done is going to require a significant rework of the code powering the whole thing as basically everything has changed since 2012. Even if we just removed all the things Apple doesn’t like, there would still be tons to do to get the rest of it running properly on iOS 10. We had hoped this was something we could do if our Patreon was successful, but over a year into that campaign and we’re still hovering at around half of what our original goal was so we really do not have the resources to get involved in significant updates to the existing app or the development of a totally new app. If there’s any silver lining to be found in this whole situation, Apple at least doesn’t seem to be removing the app from the App Store- Or, at least, we haven’t received the notification that a lot of developers have gotten on the impending removal of similarly old apps and games if they don’t get an update. So, like before, the TouchArcade app will continue to limp along with one more thing we can’t really do anything about. It’s unfortunate that a nebulous and scary sounding popup we have no control over might be leading people to delete the app, but, it’s just another wonderful thing you experience in Apple’s walled garden. For what it’s worth, I still use the app every day, and aside from it feeling a little dated, it still works great.